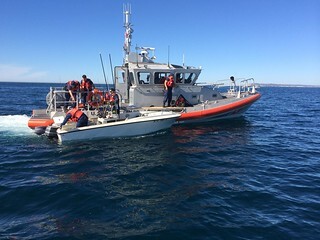 SAN DIEGO — The U.S. Coast Guard rescued three boaters two miles off the coast of Coronado after their 20-foot pleasure boat began taking on water, Friday. The San Diego Harbor Police requested Coast Guard assistance at 11:45 a.m., for the trio aboard the Eat & Run. A Coast Guard Station San Diego 45-foot Response Boat-Medium crew brings the 20-foot pleasure craft Eat & Run in tow two miles off the coast of Coronado, Jan. 17, 2014. Coast Guard photo by Petty Officer 3rd Class Dane Lee. A Coast Guard Station San Diego 33-foot Special Purpose Craft crew and 45-foot Response Boat-Medium crew, a good Samaritan, the Harbor Police and San Diego Lifeguards responded to the call and an urgent marine information broadcast to mariners was issued. The good Samaritan aboard the pleasure boat Dooey Duck gave the boaters a hand-operated dewatering pump. The 33-foot boatcrew removed the men from the vessel and transported them to Shelter Island. Station crewmembers continued to dewater the vessel as the 45-foot response boat towed the vessel to Shelter Island. The Eat & Run was trailered once it arrived in Shelter Island. The cause of the flooding is currently unknown.